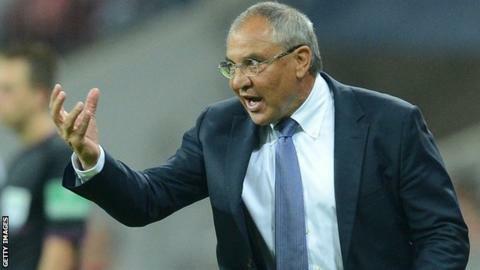 Fans of Felix Magath liken him to a demon headmaster. One of his former players claims he was more like Saddam Hussein. Another one dubbed him "the last dictator in Europe". None of this sounds good. Perhaps Dimitar Berbatov, who left Craven Cottage in January, learned of the imminent arrival of Fulham's new manager in a premonition and got spooked. "Pack your bags, Mrs Berbatov, we're moving to Monaco." Certainly, the notoriously sedentary Bulgarian striker is better off out of it. But hack your way through the sensationalist stories - about outlandish fines, about players collapsing on beaches and halfway up mountains and having their water bottles emptied while on gruelling training runs through Alpine forests - and you will find plenty of former Magath charges who respect and revere him. Why wouldn't you? This is a man who won three Bundesliga titles in the last decade. With Bayern Munich he won the league and cup double twice in two years. He delivered unfashionable Wolfsburg their first league title. But it was as a firefighter that Magath made his name. Indeed, Magath was to German football what Red Adair was to the US oil industry, a man who never came across a blowout he could not quell. "When he took over at Hamburg [in 1995] we were bottom of the league," says Stephane Henchoz, the former Blackburn Rovers and Liverpool defender. "He didn't speak a lot but he got results by working the team very hard and putting discipline in the squad. There was a lot of running through forests and over hills, probably the same methods he was used to as a player in the 1970s and 80s. It was quite basic and it was hard but it was needed at the time. "For one January training camp, instead of flying somewhere warm, he drove us to a very cold part of Germany. We had to get up at 6am and we'd be out running in the snow at 6.30, when it was still dark. "But to call him Saddam Hussein is a bit strong. I understand where his critics are coming from but we're only speaking about football training. As far as I know, Felix Magath never killed anybody on one of his runs. To call him Saddam Hussein is a bit strong. I understand where his critics are coming from but we're only speaking about football training. As far as I know, Felix Magath never killed anybody on one of his runs. "It's always difficult when you're training so hard because you feel like you're training too hard. But when you were last in the league and now you're in the top six, you believe in the methods. He's the perfect man for Fulham." Having led Hamburg into the Uefa Cup, Magath was sacked the following season. This is a recurring theme of Magath's career - recovery, boom and bust. After Hamburg, Magath took Nuremberg from bottom of the second tier to the Bundesliga. When BBC Sport asked former Nuremberg midfielder Michael Wiesinger about Magath's training methods, he swallowed up a snigger before replying: "He's certainly a special one." But he could not deny they worked. After a row with Nuremberg's president - he has a lot of those - Magath landed at Werder Bremen, another club he managed to drag clear of danger. "Playing under Felix was an experience of a lifetime," chuckles former Werder Bremen and Wolverhampton Wanderers striker Havard Flo. "He was tough, he expected commitment from his players and if he didn't get it, he would let you have it. I won't use the word 'dictator', but he's strong at giving orders and setting agendas. "He was very proud of his fitness for an older guy. He'd take us into the forest and before we set off he'd line us up and say, 'Nobody is to run in front of me and nobody is to fall more than 20m behind me.' And then he'd be off. "He could run to the end of the world, so we could be running for 40 minutes or two hours. It was a psychological ploy. A few players would moan, saying, 'What the hell is this?' And he would be onto them immediately. "But I'm Norwegian, so I'm used to giving 100% and doing what the boss tells me. As long as you did what he said, even if he could see your limitations, he would back you and it could be a nice ride for a player. I had a really good connection with the man and wish I'd spent more time with him." After a couple of years with Frankfurt, whom he also saved from the drop in his first season, Magath took over at Stuttgart. He transformed them from relegation strugglers to Bundesliga runners-up, delivering them Champions League football for the first time. "Stick it out and do what he asks and he'll get the best out of the team and the team will get the best out of him," says Sean Dundee, the South African-born striker who joined Stuttgart from Liverpool in 1999. "I asked him after one training session: 'Why are you always picking on me?' He said: 'Be happy that I pick on you because if I didn't, it would mean that I didn't care.' That stuck with me, I looked upon being picked on as a positive. "During his pre-match team talks he'd stir his tea and ask his players about opposition tactics. He'd get angry if you hadn't done your homework. "I used to write down the names of opposition players on my arm, because if I couldn't answer a question he'd speak to me later and tell me I wasn't taking the game seriously enough." But Magath, the son of a US serviceman and a German mother and a keen chess player, has a softer and more subtle side. Indeed, there are shades of the great Brian Clough in some of his team-building tactics. Dundee recalls long team walks after breakfast, during which mobile phones and personal stereos were banned. Flo recalls being ordered out of his hotel room and summoned to the bar the evening before matches, where players would be encouraged to drink beer and talk about things other than football. With such eccentric methods, Magath salvaged an awful lot of seasons. But while Red Adair revelled in the nickname 'Hellfighter', Magath was dubbed 'Qualix', a mash-up of his given name and the German verb 'qualen', meaning 'to torture'. And even his most earnest supporters can understand why. Dundee remembers his Stuttgart team-mate Thomas Schneider being "murdered" with running sessions for a fortnight, having returned a day late following the birth of his child. Schneider had been with the club for 20 years. Flo concedes Magath cut some of Werder Bremen's foreign contingent little slack, or at least those who struggled with German. "We had a couple of Ukrainian players in that team and their German wasn't the best," says Flo. "Felix gave them a really tough time, telling them that they had to communicate in German if they wanted to play for his team." Still, former Liverpool and Blackburn defender Markus Babbel says most of Stuttgart's players had only good things to say about Magath when he joined the club in 2004, shortly after the manager's departure for Bayern Munich. "He took over a club that was in pieces," says Babbel. "He brought through players like Philipp Lahm, Kevin Kuranyi, Alexander Hleb, Timo Hildebrand and brought them Champions League football. He was a legend in Stuttgart. If the total focus on success is old-fashioned, then I am old-fashioned, too." However, with success came a Messiah complex, something that is not required at a perennially successful club such as Bayern. So despite his two league and cup doubles in three seasons in Munich, he is remembered far less fondly. "I would never want to treat human beings like he does," said Bayern president Uli Hoeness last week, as if he was speaking about… well, Saddam Hussein. But Wolfsburg welcomed Magath with open arms and he repaid their faith, leading them to the Bundesliga title in his second season in charge. It was an achievement roughly equivalent to Clough delivering First Division titles to so-called provincial English clubs Derby and Nottingham Forest. In 2009, Magath joined Schalke, who finished runners-up in the Bundesliga in his first season in charge. At which point Magath appears to have lost it. Perhaps it was his hunger for total control (as at Stuttgart and Wolfsburg, Magath combined the roles of manager and director of football at Schalke)? Perhaps it was because some were unaware of his achievements as a player (Magath won the European Cup with Hamburg, the 1980 European Championship with Germany and played in two World Cups)? Whatever it was, just about everybody at Schalke couldn't wait to see the back of him. Having rejoined Wolfsburg in March 2011, Magath saved them from relegation. He led them to mid-table respectability the following season but destroyed any goodwill he had fostered during his glorious first stint in charge. "He's not even a hero at Wolfsburg," says German football expert Raphael Honigstein. "He bought and sold so many players, nobody was sure who was in the team at any given time. It was a system of hire and fire and trial and error, players bought and played a couple of times and never seen again. "In the end, everyone at the club lost patience with him and he realised he needed to take a break from football and resurrect his career elsewhere. Even Hamburg, despite being in desperate trouble themselves, didn't want him. "If you want sustained success, he's probably not the right man. But he might turn out to be a viable short-term option for Fulham. They're already bottom of the Premier League table, so it can't really get much worse for them." Describing an oil well blowout, Red Adair once said: "It scares you, all the noise, the rattling, the shaking. But the look on everybody's faces when you're done and the well is under control, they're the best smiles in the world." Magath might just be the man to quell all that rattling and shaking going on down at Craven Cottage. Just don't expect those smiles to last too long.